You might have an idea to convert normal videos from other format into iPad 3, the long-anticipated Apple device. Unfortunately, the same as iPad 1 or iPad 2, iPad 3 only supports few video formats - MP4 (H.264, MPEG-4 video codec). To play video on iPad 3 properly, you need to convert video to iPad 3 compatible format at first. Therefore, an effective video transcoder is indispensable. The following guide explains detailed solution on encoding video to iPad 3, like AVI, FLV, WMV, MKV, MOV, 3GP, RM, RMVB, DivX, XviD video, for transferring the video files to iPad 3 to enjoy visual life. • Encode video to iPad 3/mini 4, iPad Air 2/iPad Pro, iPhone X/8/7/6s/6/Plus/SE, iPod, Apple TV, Android, etc. • download video from YouTube, Myspace, Metacafe and 1000 more sites for iPad iPhone, iPod, Apple TV, Android, etc. Best iPad 3 video processing app to convert MP4, MKV, MTS, FLV, 3GP, HEVC, etc in UHD/HD/SD to iPad 3/mini 4/Air 2/Pro and more with the fastest speed and no quality loss. MacX supplies you ultra-fast conversion speed as well as loss-less video quality. Depending on your operating system, download either video to iPad 3 converter for Mac or iPad video converting app for Windows, install and launch it. Below is an example of transcoding video to iPad 3 on macOS. Directly drag & drop your video files to this video processing program, or click "Add File" button to load the files. Click "to iPad" button, and choose the desired profile among the drop-down profile list based on your iPad 3. You can also choose the audio/video quality, frame rate, and other parameters according to your own needs. After finish the above steps, click the "RUN" button to start converting video to iPad 3, you could view the whole conversion progress and are able to cancel the process at anytime. Do you want to encode video for playback on iPad tablet? This article shares 3 best video converting tools for iPad and tells you how to transcode MKV M2TS FLV AVI MP4 to iPad Air/iPad Mini 2/iPad 4/3/2 viewable format easily. 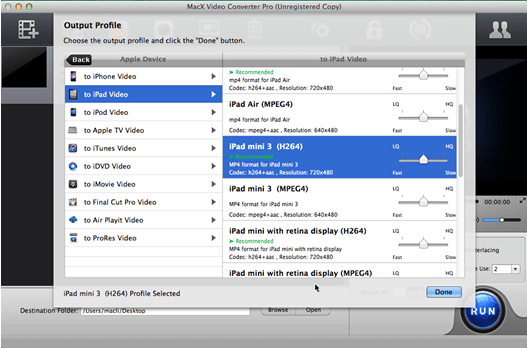 MacX Video Converter Pro provides the fastest conversion process for you to decode and add MP4 video to iPad Air readable format with high quality.